Great photographic printing technology in a 44-inch professional wide-format printer. It uses enhanced 8-colour ink technology to print uncompromising quality. It's Epson UltraChrome K3 professional-level ink technology with Vivid Magenta pigments and a three-level black technology to present quality levels for professional colour and black-and-white prints. Archival prints with amazing colour, gloss level, and scratch resistance for consistently stable colours that outperform lesser ink technologies. High level ink droplet accuracy from a MicroPiezo AMC print head and ink repelling coating technology reduces nozzle clogging. You get a resolution of 2880 x 1440 dpi. 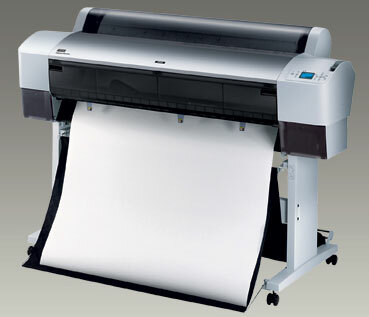 It will handle virtually any media type, in roll or cut-sheet, up to 44-inches wide. Great for saleable colour, black-and-white photography, fine art reproduction, or colour accurate proofs for client approvals. Sign up for the Willox newsletter today!